Like many of the world's greatest inventions, Shwood's "Newspaper" collection began with a germ of a question: What if we could return paper—specifically newspaper—to some semblance of its original state? Led down a path of "transformation, reconstruction, and repurposing," the Portland-based eyewear purveyor found itself crafting a response. 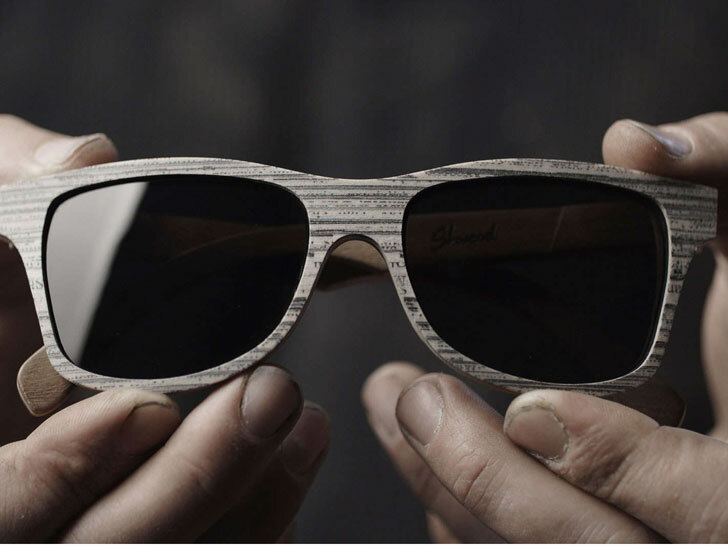 Within a year, Shwood developed a technique to call its own: first, by rolling up thousands of feet of newsprint into a 4-inch-diameter "logs," then, by sawing them to uncover the dense woodgrain-like textures hidden within. Shwood treated the reconstituted material like a type of veneer, layering it onto the temples of its signature “Canby” model—in both wooden and cellulose-acetate versions—to give it the structural integrity it needed. Shwood also produced a limited-edition—and currently sold-out—run of the glasses with newspaper plastered onto the entirety of the frames. Shwood treated the reconstituted material like a type of veneer, layering it onto the temples of its signature "Canby" model—in both wooden and cellulose-acetate versions—to give it the structural integrity it needed. All wooden frames are made from sustainably harvested lumber from "authorized and supervised" plantations worldwide, according to the company.. Equally sustainable, its cellulose-acetate frames are derived from a renewable blend of cotton and wood pulp. What makes the collection special isn't just Shwood's sense of accomplishment, but what the project represents for the firm. "It’s the manifestation of an idea that was willed into existence," the company says. "And it made for some pretty cool looking glasses, too."